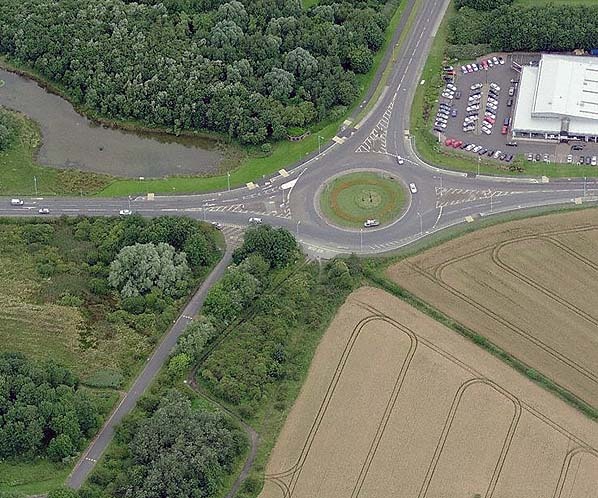 Present state: Demolished: a roundabout occupies the northern end of the station site. The goods yard coal drops have been dismantled and reassembled at Beamish - the living museum of the north. Notes: Passenger trains on the main line between Darlington and Gateshead began on 18 June 1844, and Boldon appeared in the passenger timetable in August. In the June 1849 timetable, when the main line had been extended into Newcastle over a temporary Tyne bridge, six southbound and five northbound trains called at Boldon on weekdays, with four in each direction on Sundays. On 1 October 1850 a new direct main line route via Usworth opened between Washington and Pelaw, but a limited service continued from Chester-le-Street (Durham Turnpike) and Vigo calling at Boldon. These trains ceased to run in December 1853, and Boldon closed to passengers. 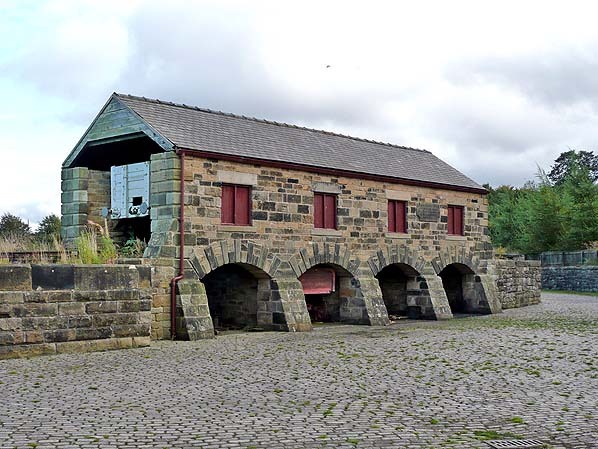 However it remained in use as a goods station, and at some date after 1914 it was renamed West Boldon (as distinct from East Boldon, formerly Cleadon Lane, on the Newcastle – Sunderland route). The ‘Old Main Line’ was the name frequently given to the railway between Ferryhill and Pelaw in County Durham which, from 1850 until 1872 formed part of the ‘East Coast’ route from London (Kings Cross) to Newcastle. Prior to 1850 trains ran via Brockley Whins, prior to the opening of the Washington – Pelaw line, and until 1848 terminated at Gateshead rather than Newcastle. From 1872 the present East Coast main line route was used, with diversions in 1906 when the opening of King Edward Bridge removed the need to travel via Gateshead (West) and at Newton Hall Junction, north of Durham, where the curvature of the tracks was reduced in the late 1960s. The evolution of the ‘Old Main Line’ was far from straightforward. By the beginning of the nineteenth century waggonways were already in existence to move coal from the mines in south-east Northumberland and north-eastern County Durham to tidal water for export. It stands to reason that passengers will have been carried unofficially on such lines, but the first recorded passenger transport by rail in north-east Durham was in 1834 on the Pontop & South Shields route. Originally opened as the Stanhope & Tyne Railroad, it was not established by parliamentary Act but was built on the ‘wayleave’ system under a Deed of Settlement dated 3 February 1834, perhaps to conceal the ambitious nature of the scheme, which was 33¾ miles in length. Under this arrangement the company was to pay a toll, based on the amount of traffic carried, to each landowner through whose property the railway passed. The south-western end of the line was in Weardale, on the moors just south of Stanhope. Here limestone was quarried, and there were deposits of coal available at intervals between Consett and South Shields. In July 1832 building of the line began, and progress was rapid. Although much of the terrain it crossed was moorland at high altitude, few earthworks were constructed or excavated, and some steep slopes on the south-western section of the route were negotiated with inclines; indeed more than half was worked by inclined planes, either self-acting or with a winding engine, and a few near-level stretches were worked by horses. Locomotives were used only at the eastern end. Much of the line remained unfenced until it closed in the 1960s. The route from Stanhope lime-kilns to Annfield was opened on 15 May 1834, and the eastern section onward to South Shields on 10 September 1834. The engineer T E Harrison surveyed the route; he was to become one of the most influential personnel of the NER. The carriage of minerals was the priority of the Stanhope & Tyne, and no attempt was made to serve centres of population which would generate passenger traffic. Nevertheless there were requests for passengers to be conveyed so they were permitted to ride free-of-charge on top of the coal wagons. Soon a wagon was attached specifically for passenger use, and shortly afterwards a separate locomotive-hauled passenger coach was provided fortnightly on pay days. Finally, on 16 April 1835, a full passenger service was instated between Durham Turnpike (one mile north of Chester-le-Street) and South Shields, possibly calling from the start at Vigo and Washington. At South Shields a nearby inn sold tickets, and passengers boarded the train in sidings. Part of this route, from Washington to Brockley Whins, was to become a section of the original ‘Old Main Line’. The isolated stretch of passenger railway between Durham Turnpike and South Shields was joined by the Brandling Junction Railway from Gateshead to Brockley Whins, three miles south-west of South Shields, opening to minerals on 30 August 1838 and passengers on 5 September 1839; and the Durham Junction Railway, stretching north from an obscure terminus at Rainton Meadow (with horse-bus connection to Durham) to Washington opened for mineral traffic on 24 August 1838 and passengers on 9 March 1840. Unfortunately the cost of running the Stanhope & Tyne proved unsustainable. In the moorlands wayleaves cost about £25 per mile per year, but at the eastern end the figures were £300 or more. The outgoings on wayleaves alone amounted to £5,600. Plans for a dock (where Tyne Dock was later opened) were abandoned. Traffic did not develop to the expected levels and the wayleaves proved to be financially crippling. By the close of 1840 the railway company was £440,000 in debt, and it was wound up on 5 February 1841. The following year the Pontop & South Shields Railway obtained an Act to take over the northern end of its track which had hosted the passenger service. The Derwent Iron Company took control of the section south-west of Carr House to bring limestone from Stanhope to its furnaces at Consett. This section later passed into the hands of the S&D. The Brandling Junction Railway (BJ) originated as a private venture by brothers R W and J Brandling to connect Gateshead, South Shields and Monkwearmouth. The brothers obtained an Act to buy or purchase leases for the land over which their lines would pass, but they chose to proceed by the wayleave system. A company came into being on 7 September 1835 to acquire the assets of the Brandling Railway, and as the Brandling Junction Railway Company it was incorporated by Act of Parliament on 7 June 1836. The Stanhope & Tyne also sponsored a Gateshead, South Shields & Monkwearmouth Railway, but discussions with the BJR resulted in the abandonment of the plan. The BJR opened in three sections. The first was from the Newcastle & Carlisle Railway’s Redheugh in Gateshead, adjacent to the River Tyne, which ascended at 1:23 through Greenes Field to Oakwellgate; this was operated by a stationary engine. A self-acting incline from Gateshead Quayside was opened with it on the same day, 15 January 1839. The route from South Shields to Monkwearmouth opened on 19 June 1839, followed by the connecting lines between Gateshead and Cleadon Lane (later East Boldon) and between Brockley Whins and Green Lane (north-east of Brockley Whins) on 5 September 1839. A chord known as the Newton Garths branch opened on 9 September 1839 between East Boldon and West Boldon junctions, immediately south-east of Pontop Crossing, but this was not used by passenger trains. On 9 March 1840 the west-to-north link between the BJ and S&T opened at Pontop Crossing which enabled through services between the several termini at Gateshead, South Shields, Monkwearmouth and the Durham Junction Railway’s Rainton Meadows to operate. However services from the south had, at first, to reverse from just north of Pontop Crossing to reach Brockley Whins in a complex operation (described on the Brockley Whins page). The Durham Junction Railway (DJ) was authorised by an Act of 16 June 1834. It became an important link in the chain of railways forming the ‘Old Main Line’, the original intention was merely to redirect to the Tyne coal from the pits in the Houghton-le-Spring area, and from pits served by the Hartlepool Railway. 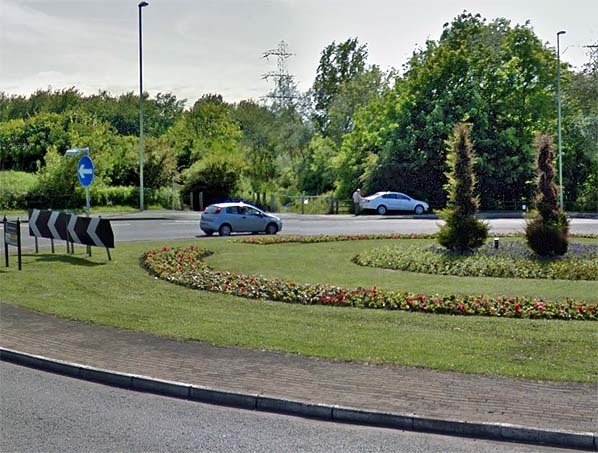 Even these modest ambitions were not realised as its southern terminus was to be at Rainton Meadows, two miles short of Moorsley, its intended destination, and the Houghton-le-Spring branch, authorised by an Act of 1837, was never constructed. Nevertheless a ‘Station Road’ was partly constructed in Houghton – the triumph of hope over reality – which was to be one of the largest population centres in the North-East never to have the benefit of a passenger station. The DJ’s crowning glory was the stately stone viaduct over the River Wear between Penshaw and Washington, and based upon the Roman bridge at Alcántara, Spain. The last stone was laid on the day of Queen Victoria’s coronation, 28 June 1838, thus it was named Victoria Bridge (or Viaduct). The engineer T E Harrison constructed four main arches, those at each end of 100ft span and the two central arches of 160ft and 144ft; the total length was 811ft and the height above water level was 135ft. In 1843 the DJ became part of the portfolio of the ambitious George Hudson (the ‘Railway King’) as part of his plan for an integrated east-coast route. The Act of 23 May 1844 which confirmed his purchase of the line also made provision for the project of bridging the Tyne. At Washington the DJ connected with the Stanhope & Tyne whose metals were used as far as Brockley Whins. Here the BJ line was joined, and the passenger service between Rainton Meadows and Gateshead took this route from its inception on 9 March 1840. The S&T owned over half of the DJ shares and also worked the services. As noted above a reversal was necessary at Brockley Whins, and this inconvenience was compounded by congestion caused by the DJ and S&T/P&SS trains sharing the line between Washington and Brockley Whins. To allow more efficient operation powers were sought to construct a direct curve and to widen the line between Washington and Brockley Whins: an Act of 23 May 1844 authorised these projects. The curve was on a difficult site intersected by the River Don and was constructed on a wooden viaduct which stood until 1940. The viaduct was used by main line trains until 1 October 1850 when the more direct route between Washington and Pelaw via Usworth was opened. For the next stage in the evolution of the ‘Old Main Line’ through County Durham it is necessary to return to the 1830s. The Great North of England Railway obtained its Act for a route from Redheugh Quay at Gateshead to Croft (south of Darlington) on 4 July 1836. After opening from York to Darlington the GNE decided, for financial reasons, not to construct the route onward to Gateshead, and on 5 October 1841 agreed to relinquish the powers to Robert Davies, James Richardson and John Hotham, who acted on behalf of the embryo Newcastle & Darlington Junction Railway. The N&DJ agreed to apply for powers to finish the line and pay all costs. The N&DJ was incorporated on 18 June 1842, and on 11 April 1843 the northern part of the GNE was transferred by Act of Parliament to the N&DJ. Work proceeded swiftly, and the line opened throughout on 15 April 1844 to mineral traffic and to passengers on 19 June. The short section between Belmont Junction (where the Durham branch left the main line) to join the Durham Junction line at Rainton Crossing was the last to be completed. There was now a direct railway link from London to the Tyne: on 18 June 1844, the day before the route opened to regular passenger traffic, a special train made history when it ran from London (Euston Square) to Gateshead in 9h 21m, including stops totalling 70 minutes. At the time of opening the N&DJ did not actually own the line beyond Washington, but had a station at Gateshead, reached via the P&SS and BJ railways: although only authorised by the Act of 23 May 1844 the station was illustrated by an engraving in a Gateshead newspaper four weeks later. The early days of the N&DJ were difficult owing to strained relations with the GNE. For details see K Hoole’s Regional History vol 4. The original ‘East Coast’ main line of 1844 therefore ran from Ferryhill to Gateshead via Shincliffe, Leamside, Penshaw, Washington, Brockley Whins and Pelaw. The Gateshead terminus was at Oakwellgate, which had opened on 5 September 1839. On 2 September 1844 Oakwellgate closed, and the service was diverted to the Greenesfield terminus, which had opened on 19 June 1844. This terminus, in turn, gave way to a new through station which would eventually be known as Gateshead East, when the main line was extended to Newcastle Central, crossing the River Tyne on a temporary bridge (opened 1 November 1848) then on the High Level Bridge, which opened on 30 August 1850. From 1 October 1850 the new, shorter route via Usworth was used between Washington and Pelaw, avoiding Brockley Whins. This ‘Old Main Line’ or ‘Leamside’ route was used until 15 January 1872 when through express services were diverted to the route via Durham. The ‘Old Main Line’ continued life as an important freight route and retained its stopping passenger service between Leamside and Ferryhill into LNER days. This service - latterly amounting to four up and five down trains on weekdays and one up on a Sunday, calling at the intermediate stations of Shincliffe and Sherburn Colliery – was to have been withdrawn in 1939 but closure was deferred until June 1941. Thereafter the Leamside – Ferryhill line was used for passenger trains diverted from the main line via Durham and for freight traffic. In 1991 British Rail mothballed the line, but owing to dumping of rubbish on the lines, removal of rails at level-crossings, theft of 2½ miles of track near Penshaw in 2003, and effects of overall neglect Network Rail decided to close the line entirely and the rails were removed by April 2013. Concrete sleepers recovered from the route are understood to be destined for re-use on the Waverley Route currently under construction between Edinburgh, Galashiels and Tweedbank. The Durham diversion was, like the development of the Leamside route, a result of evolution rather than one direct action. Access to Gateshead from the south was via Leamside until 1872, when the present-day East Coast main line superseded it. However much earlier, in July 1846, the York & Newcastle Railway announced its intention to promote a Bill for a line following a route via the Team valley from Gateshead (and ultimately Newcastle). On 30 June 1848 the Y&N – by now the York, Newcastle & Berwick Railway – obtained an Act authorising construction. The proposed route was from Gateshead via Team Valley to Newton Hall, where a branch to Durham and Bishop Auckland continued southwards, while the main line curved eastwards for about a mile then turned south to join the main line near Belmont Junction. However in 1849 the work was postponed owing to the downfall of George Hudson. The NER in 1862 revived the project, but the line authorised was only between Gateshead and Newton Hall on the Bishop Auckland branch north of Durham, which had opened from Leamside in 1857. The section eastwards from Newton Hall had been constructed as part of the Bishop Auckland branch, but there was no west-to-south curve near Leamside to allow through running from the north onto the old main line via Shincliffe. Consequently the new line could be used only as an alternative route to Durham and the south via Bishop Auckland; and at first there were only four stopping trains in each direction between Newcastle and Durham. The Team Valley route opened on 1 December 1868, and it became part of the ‘new’ East Coast main line on 15 January 1872 when the line between Relly Mill Junction (one mile south of Durham) and Tursdale Junction (one mile north of Ferryhill) was completed. Despite its name the Durham & Sunderland Railway (D&S) – not via Leamside – never did not reach Durham City. Its route from South Dock, Sunderland, extended through Murton to Haswell (where the Hartlepool Dock & Railway Company already had a terminus) which opened in 1836, with a branch from Murton through Hetton, Pittington and Sherburn House to Shincliffe, two miles south-east of the Durham City centre, which opened in 1839. The North Eastern Railway eventually diverted the line from Shincliffe to terminate in Durham at Elvet station in 1893. The Bishop Auckland branch from Leamside via Durham opened to passengers on 1 April 1857. Beyond Leamside, at Auckland Junction (later known as Leamside Junction) it swung westwards from the route to Ferryhill, crossed the River Wear on a viaduct, then sharply south-west to reach Durham City. The curious dog-leg in the route enabled the line to follow the intended course of the moribund YN&B project of 1848: see details in the section above on the ‘new’ main line. Durham City’s centre is densely built up on the narrow, steep-sided peninsula within a meander of the River Wear, dominated by the cathedral and castle; the railway did not enter this historically important area, but passed by to the north-west, where a substantial viaduct was necessary and the city’s station was found. The Leamside – Bishop Auckland branch now provided an alternative route between Durham and Sunderland, far more convenient than via the Durham & Sunderland’s Shincliffe (for Durham) terminus – which was abandoned in 1893 when the D&S was re-routed to a terminus at Durham Elvet. On the day the Bishop Auckland branch was opened the branch from Belmont Junction to Durham Gilesgate closed to passengers: this had been opened by the N&DJ on 15 April 1844, providing the first station in Durham City. Passenger services on the Sunderland – Durham line remained frequent. However from the 1920s motor buses began to provide a more intensive service and linked the numerous mining villages and towns in north-east Durham. The ‘Old Main Line’ south of Leamside lost its passenger services in 1941. On the Sunderland – Durham route, apart from the very early loss of Frankland station, between Leamside and Durham, in 1877, casualties began with Leamside in 1953, followed by Millfield in inner Sunderland in 1955. Diesel multiple units replaced steam haulage on the route during 1957. Further economies were exercised when Pallion and Penshaw were downgraded to ‘staffed halts’ and Cox Green became an ‘unstaffed halt’ on 14 August 1961. Passenger traffic censuses in summer 1962 and winter 1962-3 showed a respectable level of use on Monday-to-Friday of Hylton and Pallion stations, but limited traffic at the other stations, notably Cox Green. The Reshaping of British Railways (‘Beeching’) report of March 1963 recommended the withdrawal of passenger services between Sunderland, Durham and Bishop Auckland - as well as the services between Newcastle and Washington - and the official proposal of closure was published on 19 July 1963. Not a single objection was lodged to the Washington closure, which took place on 9 September 1963. BR must have been unprepared for the lack of resistance to this closure as a timetable for Usworth and Washington stations appeared in the winter 1963-4 North Eastern Region book. On 28 February 1964, having considered objections to the Sunderland – Durham – Bishop Auckland proposals, Ernest Marples, Minister of Transport, consented to the closure, and services were officially withdrawn on 4 May 1964. Goods services ceased between Leamside (Auckland Junction) and Durham (Newton Hall Junction) and at Finchale siding (Frankland) on 22 October 1964. The tracks into the former Fawcett Street terminus in Sunderland, which had continued as a goods facility reached from the Durham line, were severed on 3 October 1965. Goods services were retained between Penshaw and Sunderland until 21 August 1967 when they were discontinued west of Hylton Quarry sidings. In January 1971 traffic ceased between Hylton Quarry and Pallion, and the line was officially taken out of use on 20 November 1976. The remainder of the line to Hendon, including Deptford Johnson Siding closed to goods on 27 November 1984. The section of the ‘Old Main Line’ which the Sunderland – Durham services shared between Penshaw Junction and Auckland Junction continued in goods use for some years more, but was ‘mothballed’ in 1991 but closed in 2012. Route maps drawn by Alan Young. 1862 1:10,560 OS map. Boldon station opened in 1844 and for six years was on the main line from Gateshead (and later Newcastle) to the south. For a further three years, until 1853, local trains continued to call when the railway though the station reverted to carrying goods and minerals only. By the date of this map the station dealt only with such traffic, and it is described as a ‘coal and lime depot’. Although serving the substantial village of West Boldon, the station stood aloof with only a railway tavern and the small settlement of Mount Pleasant close to it. The map shows buildings on the east side of the railway, one adjoining the level crossing and another offset on the far side of the short approach track. By 1895 two short sidings, reached from the south, had been installed east of the running lines at Boldon, where the station is identified, as on the earlier map, as a coal and lime depot. Boldon would never reopen to passengers, and local people could use Brockley Whins or Cleadon Lane (renamed East Boldon) on the Sunderland – Newcastle line instead. The coal drops are seen to the left of the words 'Boldon Station. The building has been dismantled and resembled at Beamish museum. 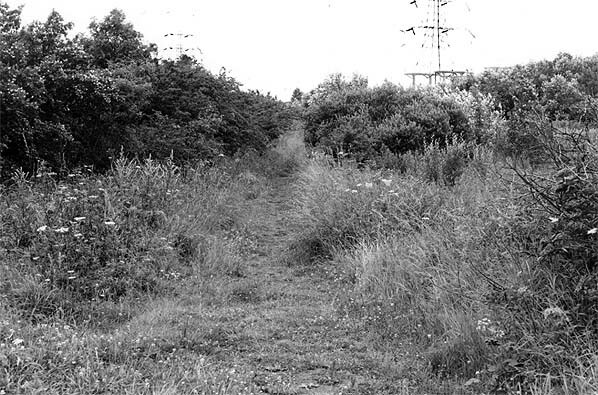 Looking south-west in August 1987; the site of Boldon station is overgrown. Boldon station site, looking south-west in 2013. The track ran across the roundabout between the two cars and through the two gates seen on the far side of the roundabout. The south side of the roundabout occupies most of the station site. One of the reconstructed buildings at Rowley Station in Beamish Museum is this Victorian coal drop, built in 1834 and designed to get bulk coal out of the rail wagons (above) into the waiting carts (below). According to the plaque on the wall of the building this one belonged to the Stanhope and Tyne Rail Road Company at their Landsale Coal & Lime Depot at West Boldon. The building can be seen on the two 1:2,500 maps above.